November 21, 2018 November 22, 2018 by John W.
You may already be aware that the phrase “NWS Marquette” does not refer to the city proper. Sometimes, however, that phrase is omitted or put in small letters at the bottom of a graphic when discussing “Marquette’s” weather. It’s especially confusing for people who aren’t from here (students, for example) or visiting. There’s about an 8 mile and 800ft elevation difference between the weather service forecast office just outside Negaunee and the lakeshore of Marquette. As a result, the former averages approximately 200″ of snow annually. The city of Marquette, as measured at the COOP station on Lakeshore Blvd, receives a yearly average of just under 120″. So about 40% less snow falls there than at the NWS office. So, no, we’re not under measuring. It may seem like Marquette received more than half a foot during that period, but drifts are excluded from our measurements. Boy are they impressive in places though! The gales will do that. We are about 100′ higher which usually means more snow. We measure more often which prevents snow from sublimating (evaporating), melting or compacting. Well, if you’re in Marquette, I hope you like a white holiday. Happy Thanksgiving to you and yours! UPDATE (later that day): Here’s an example headline: Marquette in Michigan’s Upper Peninsula sets daily snowfall record. While this is from downstate, I’ve seen similar things from the local media here. UPDATE (11/22/18): Speak of the devil, here’s a link to local media spreading confusion: Monday’s snowfall breaks record for Marquette. Earth to media: we have a 147 years of public weather records in Marquette, and, oddly, they weren’t measured in Negaunee Township. * The NWS and this station record weather from midnight to midnight. The COOP station records from 8AM – 8AM making daily comparisons a bit difficult. A Chilly November… A Chilly Year? November 14, 2018 November 15, 2018 by John W.
Yesterday, November 13th, the high was 21 (both here and at the official COOP station). The coldest high temperature on record for that day in Marquette was 20 set most recently in 1919 (tied with 1883 & 1900). We’ve recorded 5 days in row with lows in the teens! Normal lows this time of year in the city are around 30. Normal highs are in the low 40s. So far we are running more than 6 degrees below normal for the first 14 days of November. That follows a cold October. If the forecast holds, it looks like there will be a slight bump in temps today, tomorrow, and Friday, although still not quite “normal”. Then we drop right back into well below normal temps for the weekend and the beginning of next week. It’s been an up and down year so far, but we are all but guaranteed to end the year below normal — barring a record setting December. * The question is by how much? Let’s put this into the context of the past few years. In 2017 the yearly average temperature was 43.5 (when data is adjusted to match the same period of observation employed by the COOP station). That’s almost half a degree below normal. ** 2016 was about 1.4 degrees above normal. We don’t have a complete data set for 2015; however, the official station reported 0.7 degrees below normal that year. Assuming our current trend of -6.1 degrees holds for November and December is completely normal, we would end 2018 about 1.7 degrees below normal. To end 2018 above normal would require November to completely erase it’s 6 degree deficit in the remaining 14 full days followed by a December that was 14+ degrees above normal! * An earlier version of this article incorrectly stated that we were likely to end 2018 well below normal for the year (-3.5 degrees potentially). After discovering an error in the supporting math, I have softened the prediction. Additionally, I have revised the calculation method to match the measurement period of the official COOP station (an observation period of 8AM – 8AM in which each month starts and ends at 8AM the last day of the month). Note that the average temperatures reported in the yearly table on our weather history page are calculated by calendar days and months. We can do that since our station is automated. Whereas the COOP station has manually observed daily temperatures once per day using a minimum-maximum thermometer (in the mornings since about 1960 and in the afternoons before that) for over 140 years! 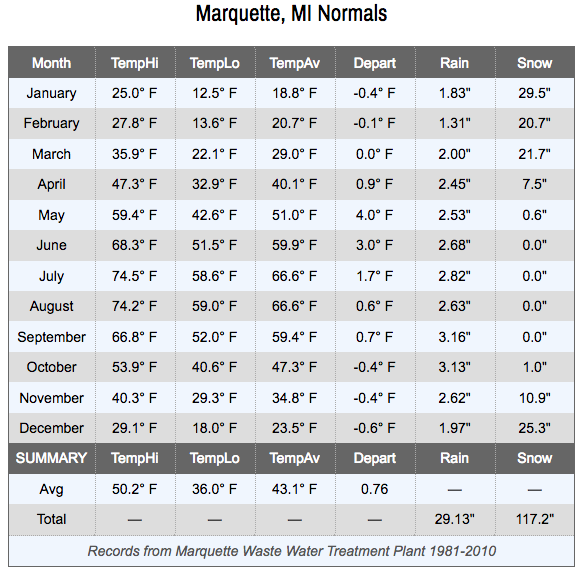 ** First we take the normal yearly average temperature over the last 30 years as measured at the Waste Water Treatment Plant, the official weather station for Marquette, which is 43.1. Then we determined the average difference between our station and the official station for every month of the year since August 2015 (listed in our weather history “normals” table under the “Depart” heading). That averages out to +0.76F. Or, put simply, 43.1 + 0.76 = 43.86 which rounds to 43.9. This preliminary number will improve over time as we collect more data.